This is the first of two quick, easy, delectable breakfasts that I hope you’ll add to your menu for the coming weekend. Remember how I’m trying to avoid kitchen waste? This recipe dawned on me while driving to church last Sunday, and I didn’t have to buy a single thing to make it. An overabundance of eggs and some gifted honey wheat bread were a perfect breakfast foundation, to which I only added a few spices and things I had camping out in the fridge. Et voilà: Eggs in a French Toast Basket. Or Moon Eggs, or Cowboy Eggs, or Camp Eggs, or any of the other weirdo names Wikipedia suggests are used for this concoction. Anyway, this is not your average version of this recipe. Toast is great and all, but as I was driving, I was thinking, Wouldn’t it be nice to spruce up the toast a bit? Maybe with that fantastic Alton Brown French toast recipe? Oh, and it was nice — very nice! 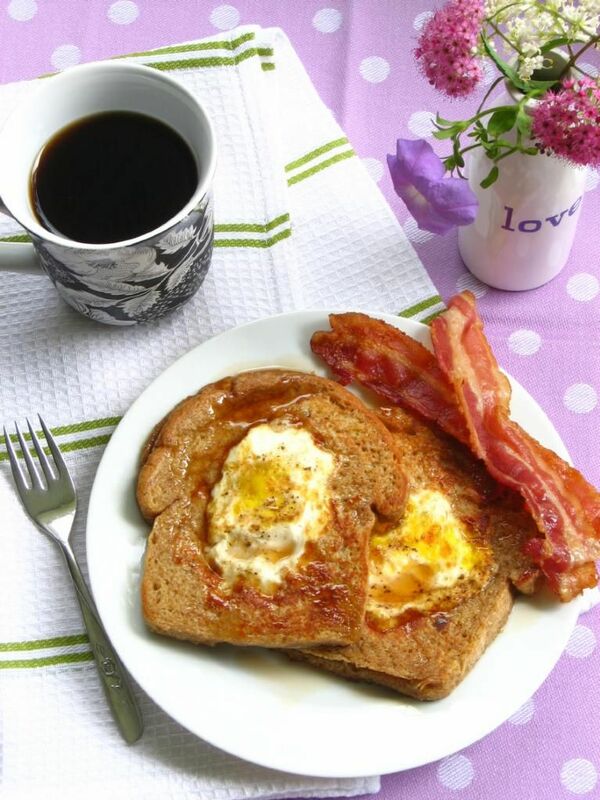 Mike and I love this crisp French toast recipe, and the included egg really bumped it up a notch. There is a slight issue; namely, French toast needs longer to cook overall than the egg, so the egg did get more done than usual (the yolk wasn’t hard, but wasn’t nice and gooey either). This is just one of those recipes where you fiddle with the timing after you cook your first slice to see how things go. 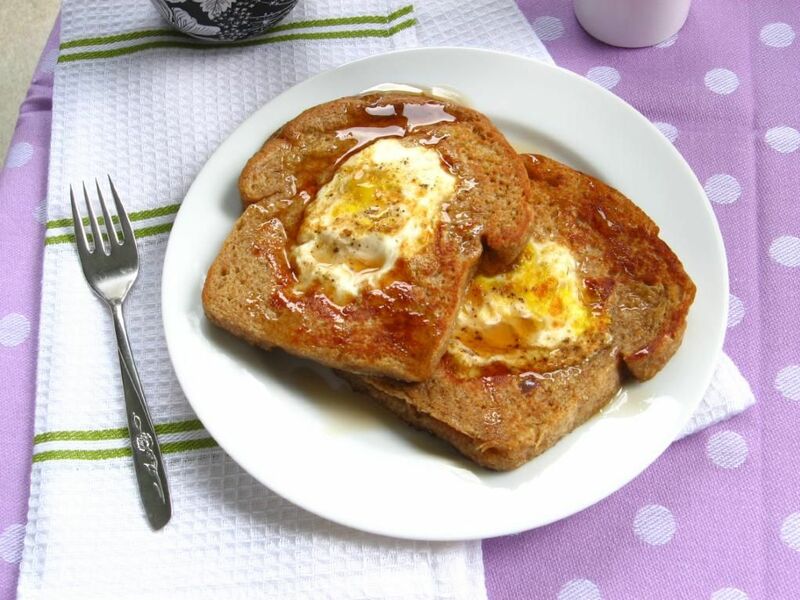 For instance, you might start the French toast and wait a minute or so before adding the egg to achieve a softer yolk. Nevertheless, Mike and I were over the moon (over the moon eggs, perhaps?) for this breakfast (or brunch, really, or maybe even lunch, since we ate ours after noon!). 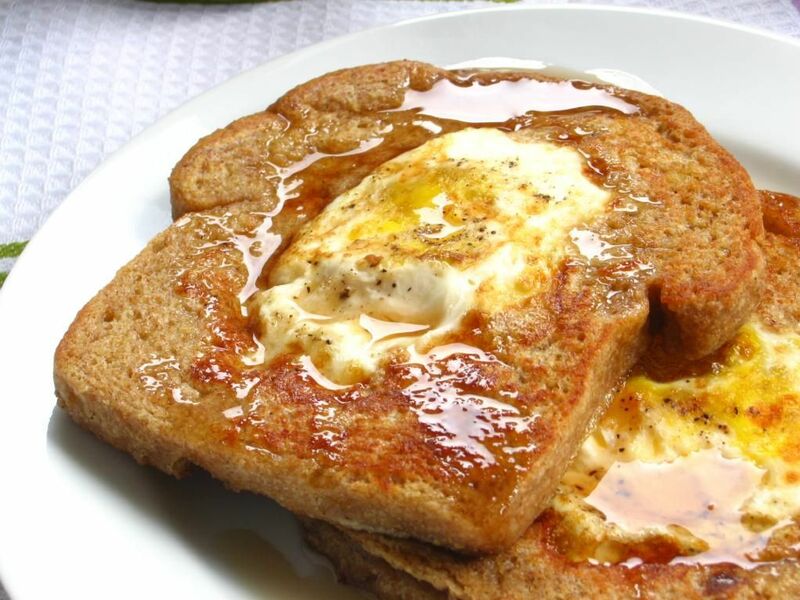 The sweet, rich French toast and the savory, salty egg were an out-of-this-world combination when hosed down with a bit of butter and some maple syrup. 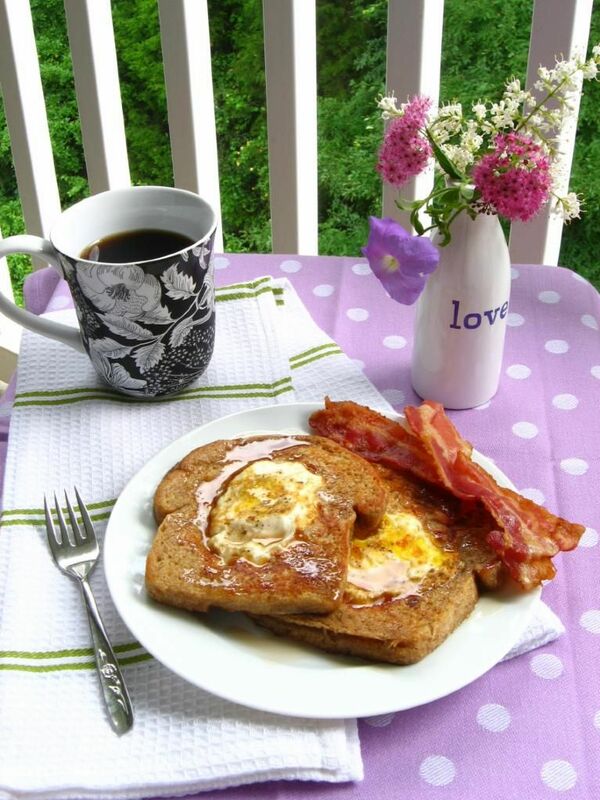 If you haven’t let yourself sit back and enjoy a nice breakfast lately, here’s your inspiration! Happy breakfasting! Recipe By: Willow Bird Baking, using Alton Brown‘s French toast as a basis. In medium size mixing bowl, whisk together the half-and-half, 3 eggs, honey, cinnamon, nutmeg, and salt. You may do this the night before. When ready to cook, pour custard mixture into a pie pan and set aside. Preheat oven to 375 degrees F. Cut a hole out of each bread slice using a cookie cutter. Dip bread into mixture, allow to soak for 30 seconds on each side, and then remove to a cooling rack that is sitting in a sheet pan, and allow to sit for 1 to 2 minutes. Over medium-low heat, melt 1 tablespoon of butter in a 10-inch nonstick saute pan. Place 2 slices of bread at a time into the pan, breaking an egg into each slice’s hole. Carefully salt and pepper just the egg. Cook approximately 2 to 3 minutes on the first side, until the bread is golden brown on the bottom. Carefully flip and cook 2 to 3 minutes on the remaining side. Remove from pan and place on rack in oven for a few minutes. Repeat with all 8 slices. Serve immediately with butter and maple syrup. P.S. Byrd Update: Byrd is doing well. I’ve been icing her little knees and keeping up with her pain medication, which she hates. She’ll get her stitches out on Tuesday, June 1, but still can’t run or play until July. Difficult for such a rambunctious critter. Thank you so much for your support! YAY waffle maker!! I’ve enjoyed mine! Ooh I wanna be hosed down with butter and syrup too!. Okay that sounded dirty- sorry! ha ha! I love eggs in a basket. I’ve also heard them called toad in a hole. I like to butter the middle rounds and toast them up too to have with jam. That’s the best part! Your french toast version sounds yummy but my husband will not be eating syrup on his eggs, whatsoever! He doesn’t do the sweet and savory, but I love it! I have been following your blog for a while and have tried a few recipes (carbonara – omg). When I saw this one yesterday, I happened not to have eaten lunch yet… and I happened to have all the ingredients. Naturally, I had to try it. Verdict: amazing! I made it with milk instead of half-and-half, and I only made enough for two slices. I also cooked the french toast on medium instead of medium-low, which browned the toast faster and left the egg yolk nice and gooey. Thanks for sharing – I’ll definitely be making this one again. Lovely, so glad to hear you enjoyed it, Natalie! 🙂 Thanks for letting me know! I see “breakfast for dinner” in my near future! 🙂 This looks delicious! I bake my French Toast which would make your recipe for an egg in the center a snap. I think i’ll try coating the bread with egg batter and breaking an egg on top before baking. This recipe uses half skillet-time and half baking, so I’ll be interested to hear how all-baking turns out! Please do let me know! Shoot with natural light, preferably at 1-3 pm in the afternoon. Never use flash with food photography. Investing in a tripod is VERY helpful if you don’t have a souped up camera. They happen to be pretty reasonably priced! Best wishes! If you start a blog, be sure to stop by and leave a link for me to check it out! Have you considered entering your A&P Spanish Bar cake recipe in Cook’s Illustrated “Lost Recipe” contest? Check out their website for me info. 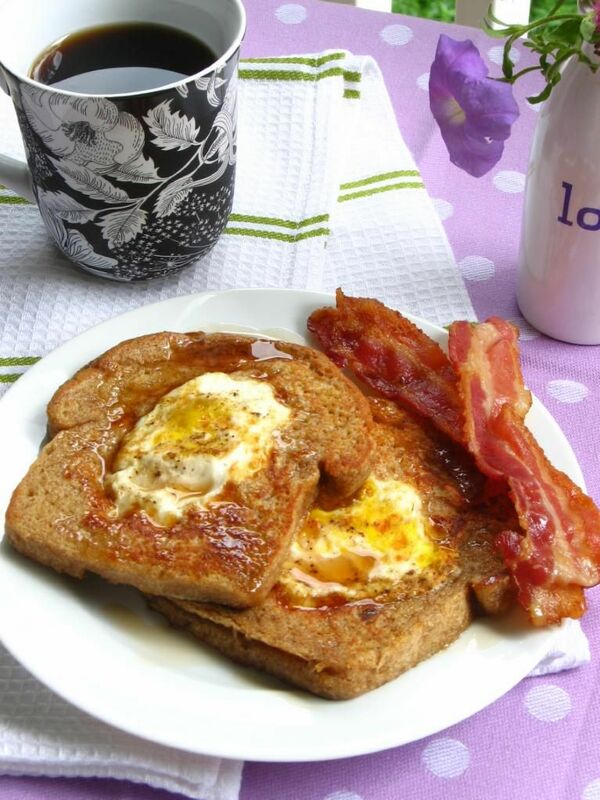 I’ve made these before with regular bread but will certainly try with french toast. We called them “Toad in the Hole”.